WPEngine is a top rated managed WordPress host for high performance, secure, and scalable hosting. Unlike traditional web hosts, they don’t support other CMS such as Drupal, Joomla, or Magento, etc. Due to managed services, it costs much higher than shared hosting. 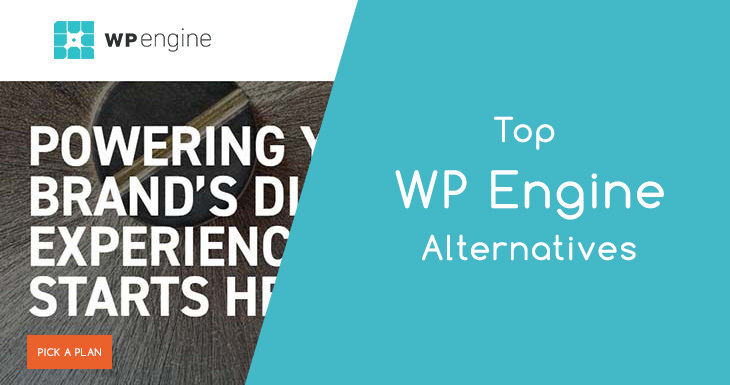 And if you’re searching for WPEngine alternatives for that reason or else, this article will help you find the cheaper and better options. But, I would like to recommend them if you’re much conscious regarding security and obsessed with robust performance as well as consider technical support should be expert while choosing any company. In my personal experience, they do have experienced and professional support staff to handle any WordPress issue. Plus, it takes few minutes to get in touch with them via live chat. Every user has different requirements and every service cannot fit for all users. So, if you’ve different issues, please mention in the comments section, I’ll update this article shortly. Now, let’s talk about top alternatives to WPEngine for managed web hosting. SiteGround was started back in 2004 by some university students and now known as one of the top web hosting provider for WordPress, Magento, Joomla, eCommerce sites, and all other types of websites. They are one of the cheapest and most affordable WP Engine alternatives to get managed WordPress hosting. In fact, you can buy shared and managed plans at the same price with unique features specially designed for WP sites. The company gained massive esteem and reputation by bloggers, businesses, marketers, and entrepreneurs to create a blog within budget. SiteGround’s core features are; excellent customer support, incredible uptime, and unbeatable loading speed compared to other hosts in the same category. Even though their plan comes with 80% lowest rates than WPEngine but they don’t compromise on performance. With the help of SSD drives, SuperCacher, NGINX, and Apache technology, SiteGround managed to deliver exceptional load speed and built-in CloudFlare can make your website even faster. SSD’s renders the data more quickly than mechanical drives. Furthermore, they monitor all servers pro-actively to address any issue that may occur in the near future and fix it at the early stage. Uptime matters a lot and it can be a success and failure point for any online business, and SiteGround knows it. So, to obtain maximum uptime, they have an in-house monitoring system and LXC technology (Linux Containers) to utilize the system resources more efficiently. This helps to handle sudden traffic and prevent downtimes which may cause due to high resources consumption. They also backup your content on daily bases. Compared to WPEngine, they also support HTTP/2 protocol to handshake SSL certificate for better and improved speed as well as free SSL certificates for all plans. You can get almost everything from SG which WPE offers but at the lowest price. After using them more than a year, I can’t resist myself to recommend them without any doubt. But, just like WPEngine, the major cons with them is monthly visitors restriction. All of their packages have a certain amount of visitors per month but there is no bandwidth limit. You also get a 30 days money back guarantee and 24/7 customer support through multiple ways such as live chat, phone, and support tickets. The FlyWheel is another one of the top WPEngine competitors and a little bit cheap managed hosting provider for WordPress powered sites. It was founded in 2012 to provide a stable and sustainable web space for developers and web designers. Although, their plans prices are quite similar to WPEngine but there are some fields where FlyWheel beats them. For example; they charge $10/month for CDN whereas WPE costs $19.95/month for CDN feature, it’s almost double. When we compare the most relevant package of both companies, you’ll find that allowed storage capacity and monthly visitors limits are same but FlyWheel has a bandwidth limit of 500 GB which is in most cases more than enough to handle medium size blog/sites. They also provide free SSL certificate, nightly backups with easy one-click restore feature. They retain last 30 day backups and store on Amazon S3 cloud. WordPress security is the consequential concerns and all the best WordPress hosts care this fact, every day thousands of websites got hacked. Well, to prevent and protect you from hackers and malware, Fly Wheel has taken some serious steps like IP blocking, limit logins, Sucuri scanning, free malware removal, strong password enforcement, and other robust security measures. They also take care of updates and the latest security patches to avoid any incidence. And of course, staging is included for all users. Free SSL security certificates by Let’s Encrypt can be installed on all of your blogs with one click button. It is super easy to activate it – no technical skills nor server knowledge required. Do you have an existing site or using another hosting provider? No problem, they will migrate it at no extra charges whereas some companies charge a significant amount for this. For example, BlueHost demands a whopping $149.99 per transfer which is unbelievable. The technical support is reachable via multiple methods including live chat, phone, and email. They also have a blog named “Layout” where you can find helpful tutorials as well as blogging stuff to enhance your knowledge. They do not offer refund policy instead you can try for 14 days without paying a single penny. Isn’t it enough to check the quality and performance of FlyWheel services? Dreamhost’s DreamPress designed to build blazingly fast, secure and sustainable websites on the WordPress platform. They have more than two decades of experience in handling web hosting services and provide shared, VPS, dedicated, and cloud storage. You can also buy a domain name as they are also known as one of the top domain registrars around the world. Their platform utilizes Ubuntu operating system to manage hosting accounts. The managed WP hosting also includes routine data backups and automatic updates which helps to protect malware and vulnerabilities. All plan comes with unlimited SSD based storage, and there is no monthly visitor cap as well as bandwidth limitation. So, your websites can handle unlimited traffic. The best part is you can install unlimited sites on a single account at comparatively lower prices than WPE which makes them one of the best WPEngine alternatives. DreamPress includes pre-installed WordPress CMS so you can start working right after the signup. It’s handy for novice bloggers and business owners who don’t like to waste their time on technical stuff. Another advantage of using DreamHost’s is they don’t have any restrictions on using plugins or anything else whereas WPEngine doesn’t allow many plugins. For instance, you’re not allowed to install cache or some security plugins but it doesn’t happen with DreamHost. You can avail the very basic plan just at $16.95/mo on a monthly basis and at much lower prices with a yearly subscription. For improved SEO Optimization and better search engine rankings they also offer SSL certificates at no extra fees. DH support and uses HTTP/2 protocol to decrease the load time thus improve overall site performance. Furthermore, advanced feature such as Varnish cache, Object cache, NGINX Technology, Brotli compression, latest PHP version helps to enhance speed. WP-CLI, GitHub, SFTP, SSH access and DDoS protection along with the multi-layer backup system also included. You can get in touch with them anytime 24/7 via different channels such as live chat, phone call, and email. But here is a major con of using them which is known as callback feature. You have to subscribe to phone callback service which costs extra money, and the live chat is also available when you sign up for one of their services. However, email support accessible for new and paid users round the clock. They offer 30 days money back guarantee for DreamPress plans and with shared packages, you get an insanely pro-long 97 days money back guarantee. No matter, if you’re a shared, dedicated, cloud or VPS server user, Media Temple provides rock-solid, resilience, and prominent hosting solutions for business, bloggers, entrepreneurs, developers, and web designers. It was founded in 1998 and headquartered in Los Angles. Currently, they are handling 1.5+ million websites in 100 countries and 125k customers worldwide. You can register your domain name, buy any type of web hosting ranging from shared to dedicated with top level support. Their public cloud service named as “Grid” built in a way to maintain your sites on multiple servers rather than a single server. In 2014, the company launched managed WP hosting to deliver highly tuned and speed optimized storage. You can choose from different plans that suit your requirement ranging from $20/month to $60/month and allow 2 to 10 sites respectively. The “Personal” plan allocated 50GB storage, 250,000 monthly traffic, and free SSL certificates. 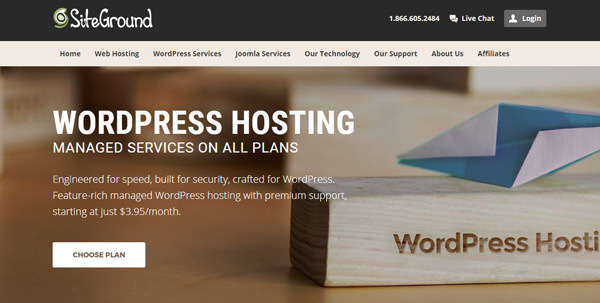 If you’re looking for exceptional WordPress hosting along with expert customer support by experienced gurus, then Media Temple should be your first choice. According to real users experience and reviews, they do offer have reliable and excellent support. Managed WP plans include DDoS attack protection, staging, site cloning, automatic updates, MySQL and PHP updates, WP-CLI, SSH, Git, SFTP, and phpMyAdmin. With these features, you can easily access the database to import/export it or edit tables. Similar to WPEngine, they also retain 30 days backup which can be restored in a few steps. For further features, there are different add-ons available such as G Suite by Google Cloud, CDN, security certificates, and website movers, etc. at extra cost. With their “Site Pack” option, you can increase the allowed number of hosted domains on a single account. However, it can increase the overall cost. Here also keep in mind, the CDN addon can be utilized for a maximum of five websites. MediaTemple claimed to deliver 99.99% uptime, and in the case of downtimes, they will give credits for a number of downtimes you face. Their “WP easy mode” plays a vital role to create a site just by providing basic information. Whenever you need help, just hit the live chat button or contact via phone call or email support. They are always there 24/7/365 to assist you anytime or browse tutorials/community blog for DIY guides. They also offer a risk free 30-day money back guarantee. 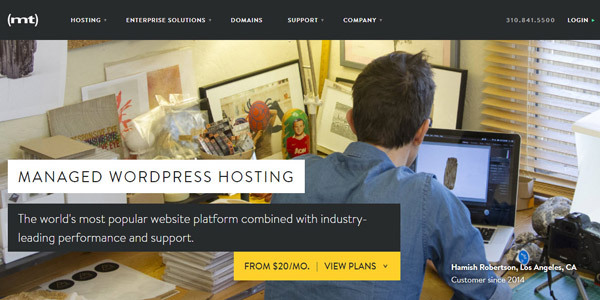 Pressable is a dedicated managed host for WordPress powered sites. They don’t offer plans for other platforms such as Joomla, Magento, or Drupal, etc. Pressable solely devoted to WP hosting solutions to deliver highly secure, scalable, and performance optimized web hosting just like WPEngine. Currently, empowering all size of blogs and business websites from startup to big companies like The American Genius, Life Edited, Six Sigma, Whirlpool, and WebVitality, etc. You can pick this alternative to WPEngine for low-cost packages as the very first plan costs just $20.83/month on annual base subscription and $25/month for a monthly base subscription. It allows you to host 5 domains and 60,000 monthly visitors which is much higher than its competitor. There is no storage limitation because each plan can support limited domains. For instance, higher plans are suitable for 10, 20, 30+, and 100+ sites respectively. Their highly scalable and flexible environment help you upgrade from low resources to higher ones with zero downtime. Compared to WPEngine, Pressable also have CDN service by MaxCDN at no additional fee which is another PLUS point. You can activate it on all of your websites to boost performance. The pre-made cache feature and optimum server-side optimization play a vital role to load your sites blazingly fast without installing any cache plugin. They scan your blog for malware on a routine basis (nightly) and have an advanced intrusion detection system for rugged security. Besides free CDN and malware scanning, all accounts also consolidate SFTP access, staging, cloning, collaborator access, daily backups, Premium Jetpack, and of course free SSL certificates by Let’s Encrypt. Collaborator access is a convenient feature using which webmasters and bloggers can create temporary access credentials and then remove them without revealing sensitive information. Restoring backup is also user friendly and takes a few clicks. When it comes to customer support, here is a major drawback of using Pressable as it lacks live chat and phone support. They only have email ticketing system to get in touch. Secondly, there is no free website migration. So you must have enough skills to migrate your site to managed host. Still skeptical about Pressable quality? Well, you can try their services for 15 days without paying a single penny. They don’t have any money back guarantee policy. No doubt, WPEngine empowering thousands of websites worldwide including some big names. Unfortunately, their plans come with high pricing tag with some (necessary) restrictions. The question is can you avail the similar feature from other managed hosting providers but at cheaper rates? And the answer is YES. There are many affordable WP Engine alternatives that offer almost all features. But due to lower prices, you may have to sacrifice on a few things. For example, the above mentioned host “Pressable” offer affordable plans than WPEngine. But, you’ll have to sacrifice on live chat support as well as phone call. However, SiteGround is also affordable, and their “GrowBig” package costs $5.95/month with outstanding customer support and SSD hosting. In a nutshell, each WPEngine alternative listed above has unique features, offerings, and service quality. You can choose any of them as per your requirements. I recommend SiteGround for the users having a limited budget and Media Temple for high-end services. They have an outstanding reputation, upvoted by real users, and unbeatable security measures.